It’s good to be a Disney fan. 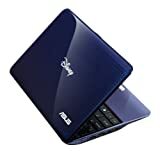 After scouring the Asus website on their netbooks, I stumbled upon the Disney Netpal that they’re about to release around August 2009. 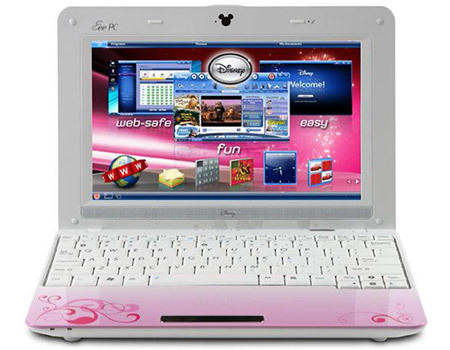 A Disney Netpal is a 8.9 inch netbook that is built for use by young and curiously-minded children ages 6-12. It is a full blown netbook having a 1.6GHz Intel Atom N270 CPU, 1GB RAM (max 2GB), 160 GB hard drive space, wireless access, and Windows XP. Each netbook is decorated with Disney design. Available in two colors — Princess Pink and Magic Blue. The software package is loaded with exclusive Disney background wallpapers, desktop icons, games, and application. The netbook is kids-proof with reinforced construction, spill-proof keyboard, protection from impact data loss, etc. It has parental-controlled permission to access of content. Just looking at the little things that truly make the Disney Netpal deserve the Disney brand. Below is a picture of Mickey Mouse’s image formed by the Disney Mix Central player forward-pause-backward control and the webcam. First off, the look-and-feel. Your kid can choose from exclusive Disney wallpaper backgrounds of their favorite Disney characters including Cars, Club Penguin, Disney Classic Characters, Disney Fairies, Disney Princess, Vintage Mickey Mouse, Toy Story, WALL-E, Hannah Montana, and Jonas Brothers. Enjoyable, learning software. Your kids can tinker around with multi-media tools learning at an early age on how to manipulate photos, music, and videos. People get paid for those skills. Parents can set what the kids are allowed to see or use. This includes who they can receive or send email, websites they can visit, and programs they can use. Parents can also schedule when their kids can access all or certain programs, such as Internet use only between 5PM-7PM. Furthermore, parents can review a report on where and how long their kids spent the time using the computer. Since the Disney Netpal is for use by children, it is kids-proof. It has a a reinforced mechanical design built to withstand impacts such getting dropped. It has a spill-proof keyboard that protects against liquid spills, and ShockShield Data Protection that guards against data loss when the computer is subjected to impacts. It also has a stable embedded polymer battery, which is safer as it prevents kids from inadvertently accessing or removing the battery and thereby subjecting themselves to electrical dangers.